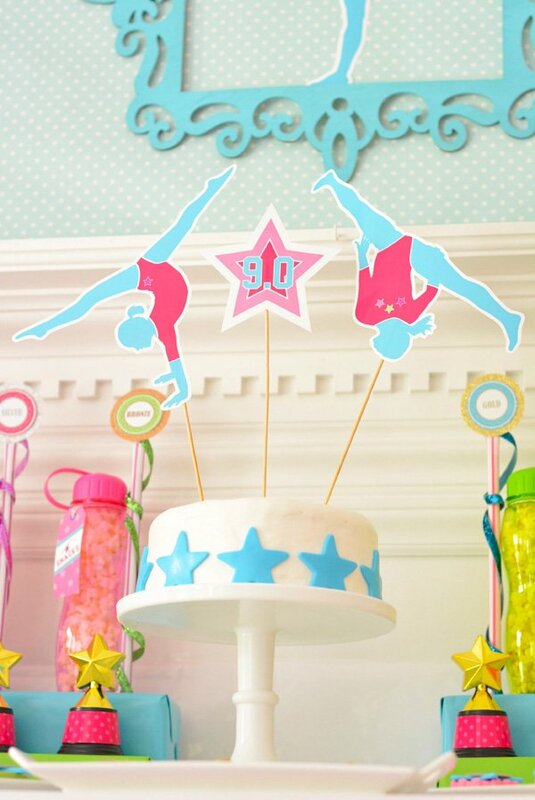 Come tumble and twirl with the birthday girl! 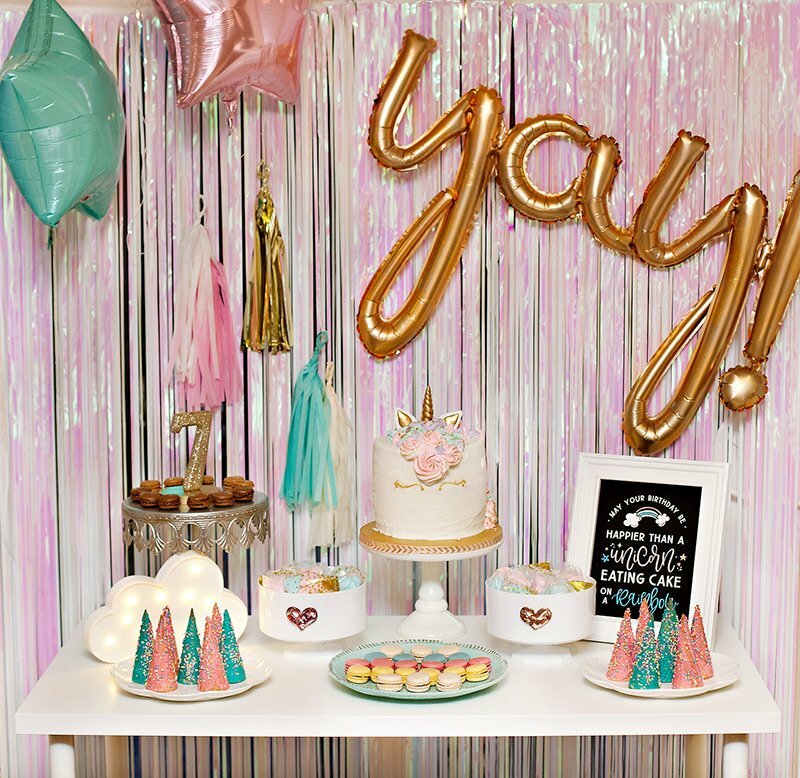 Guest Contributor Maureen Anders of Anders Ruff here to share Adria’s daughter’s Glam & Girlie Gymnastics Birthday Party. 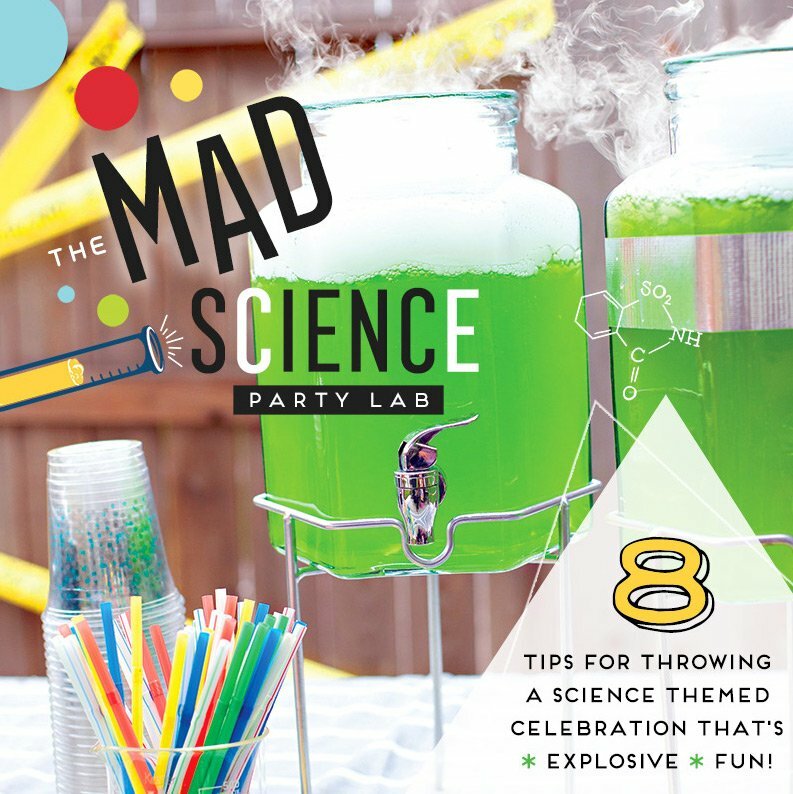 Bright and bold decorations + simple DIY decor and desserts make this party a 10.0! 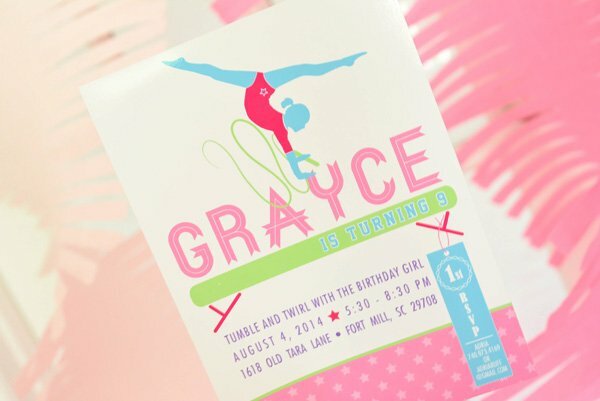 My daughter, Grayce, made our local gymnastics team this spring and insisted on having a gymnastics birthday party this year. 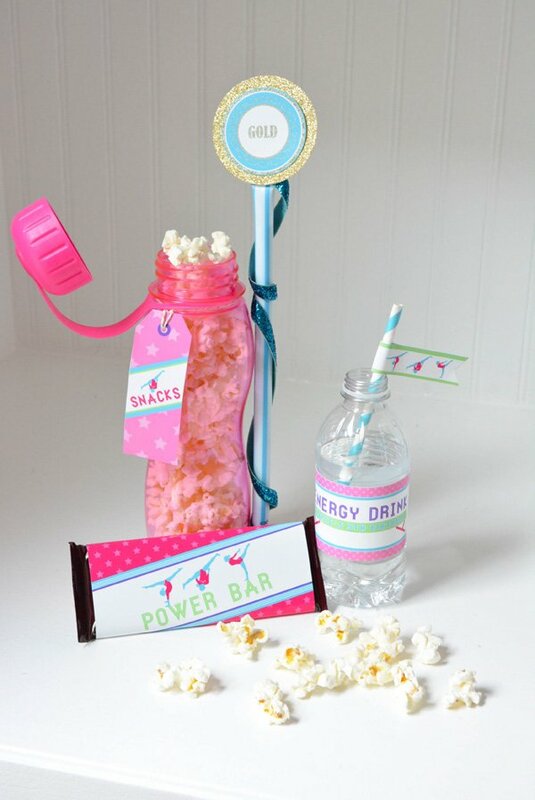 She asked for bold, fun colors including pink, aqua, lime green and purple to make it girly and fun! 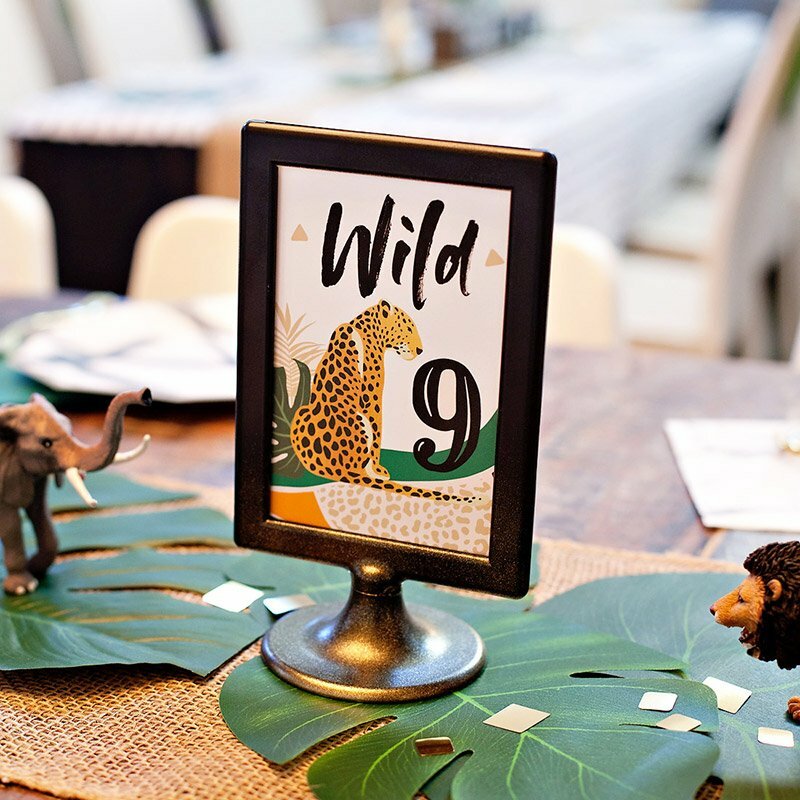 Grayce also asked for glitter and stars to be a part of the design collection along with including it in the table decor. 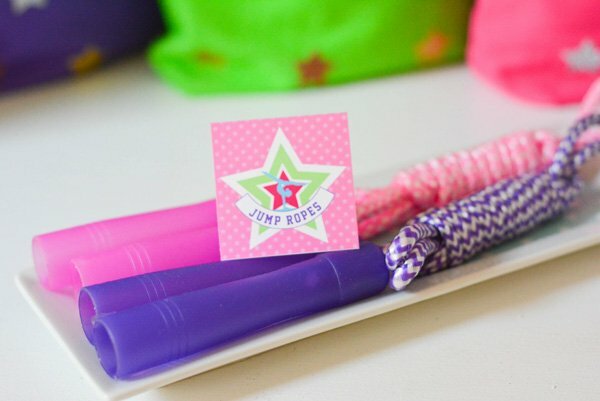 I set up the room so that the girls could participate in gymnastic events as well as timed gym sports (we had triple hula hoop and jump rope contests in addition to our “Birthday Meet”). 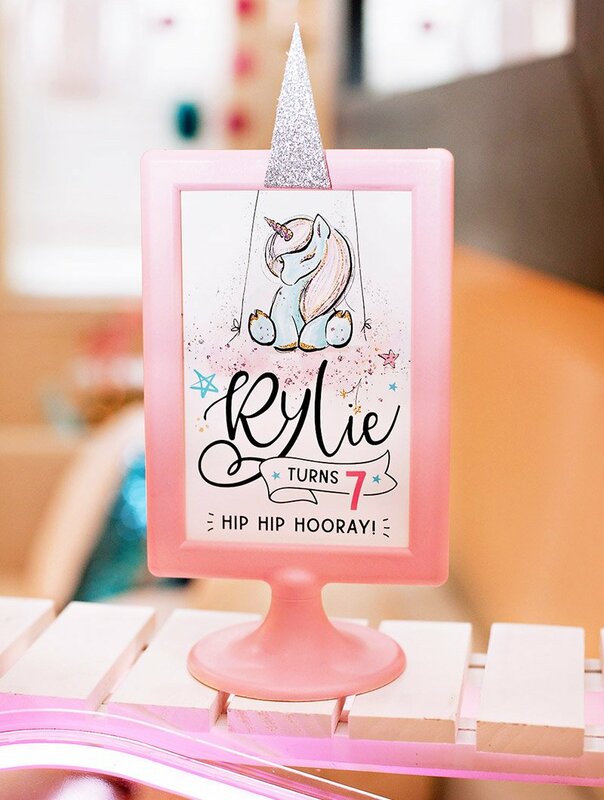 Grayce was so excited to show off the most adorable custom Biketards by Just Dance Customs along with these fabulous large hanging crepe paper twirls by Paperwhite Designs. 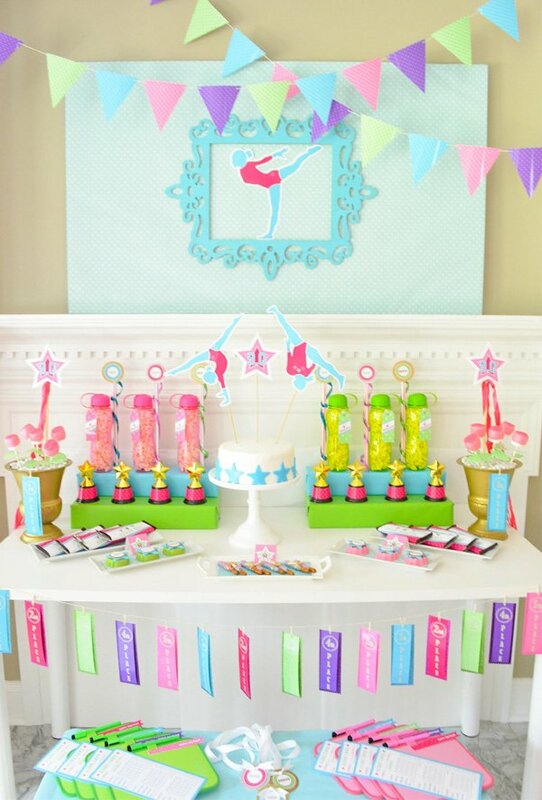 I set out trophies and ribbon wands from Oriental Trading along with printable medals and ribbons from our printable Gymnastics Collection. 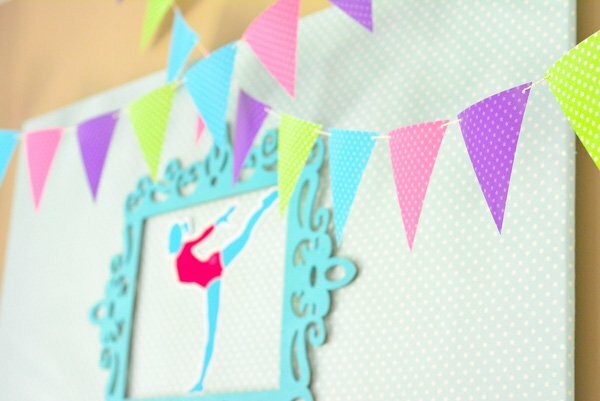 I set the room with a simple backdrop with a printable gymnastics silhouette and banner. 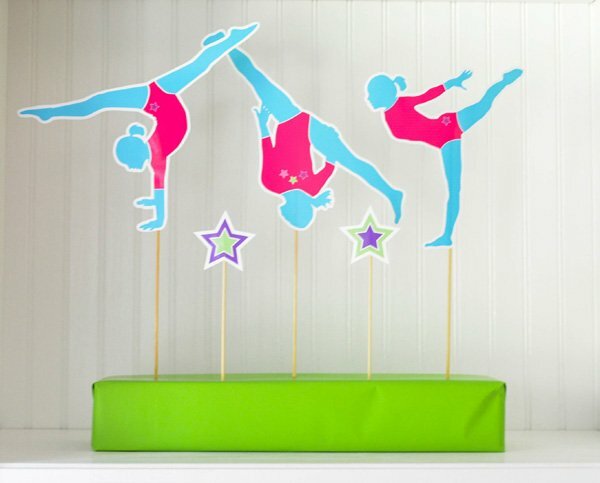 I added printable gymnast silhouettes to the cake and on either side of the shelves as well. 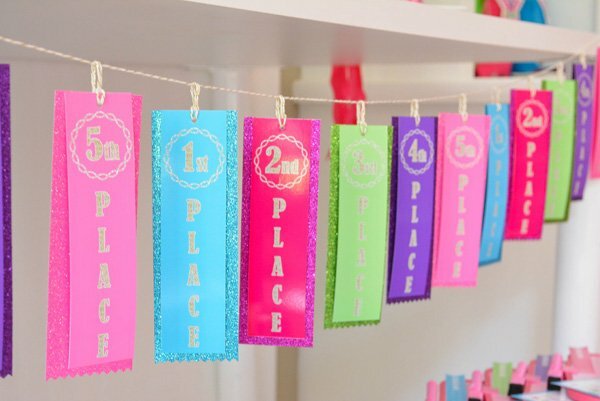 I also made a hanging printable medal ribbon banner with twine (Divine Twine) and tiered snacks and star shaped gold trophies (Rhode Island Novelty), which were displayed on colorful blocks. Both shelves also had take-home brightly colored canvas bags with extra favors inside. 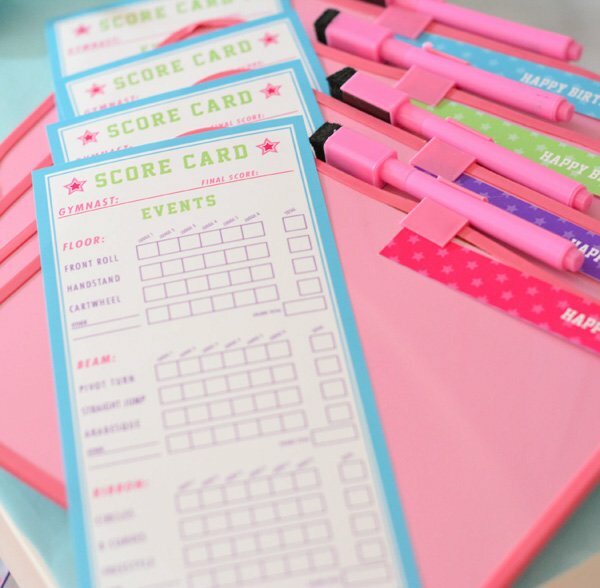 I put out a small table in front that had score boards (erase boards) and printable score sheets, along with water bottles. Grayce made the stars out of fondant with cookie cutters and I placed them around a store bought cake. Didn’t she do a great job??? 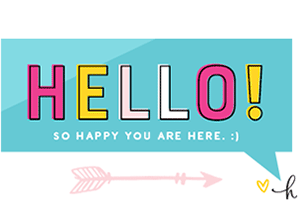 I added printable cake toppers for the final details. 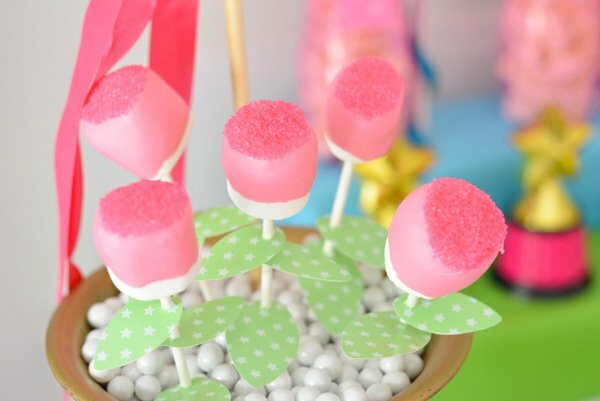 This was a perfect way to have the look of a designer cake for a low cost. 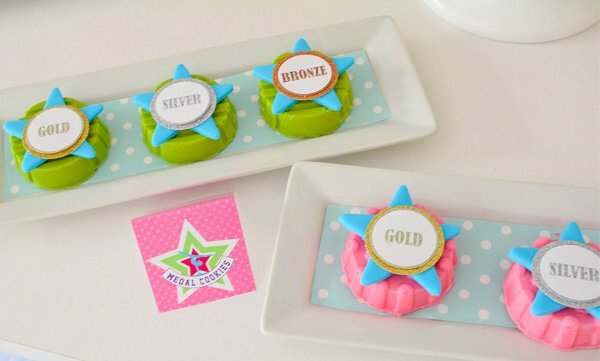 We also put the fondant stars on chocolate covered medal cookies I made and added a printable party logo medal on top. I made pink and green versions of these chocolate covered Oreo cookies and put them on plates with lined patterned paper. Each cookie came in gold, silver or bronze. 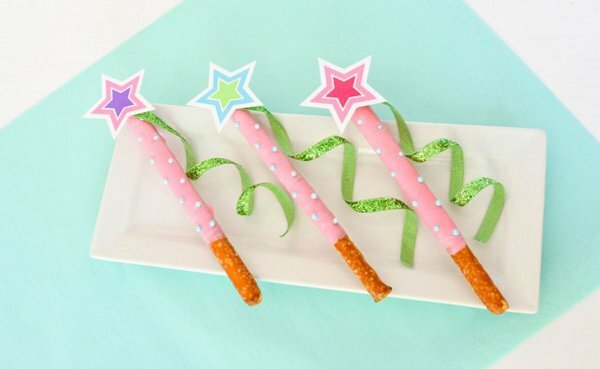 We also made ribbon wand pretzels that were super cute. 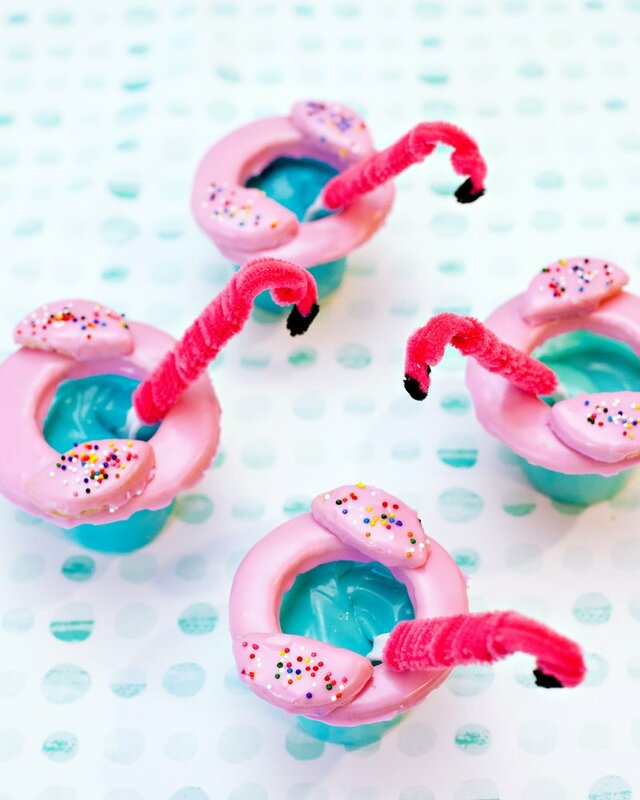 The tutorial is so easy to follow and requires no baking! 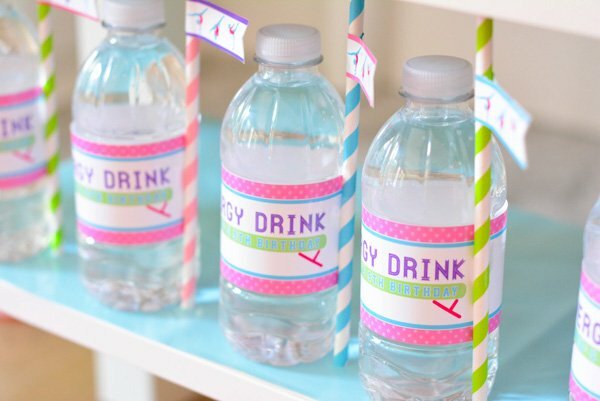 I set out sports drink bottles, filled them with popcorn and added giant pixie sticks which I turned into ribbon wands. 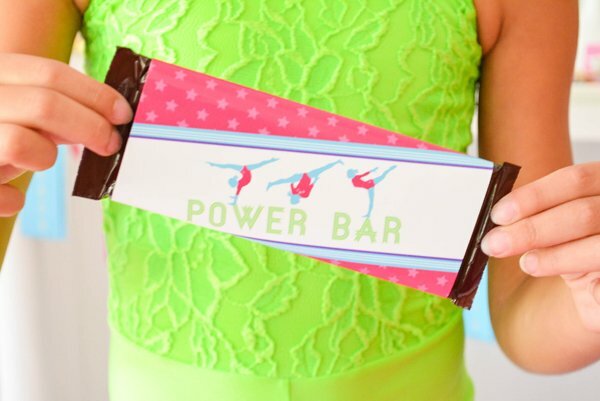 Then, I gave the girls energy drinks (water bottles) and power bars (chocolate bars) when they needed a little pick me up! Real gymnasts receive flowers when they compete, so I made sure to set out chocolate covered marshmallow flower bouquets with printable leaves. I lined each ribbon with glitter patterned paper for extra bling which hung from the flower vases! 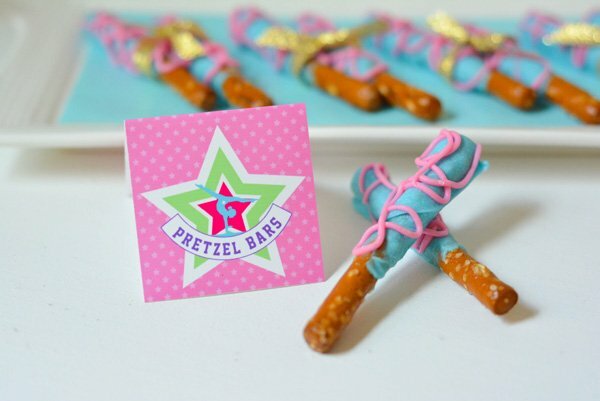 Another sweet treat I made were the chocolate covered pretzel bars (my version of uneven parallel bars). 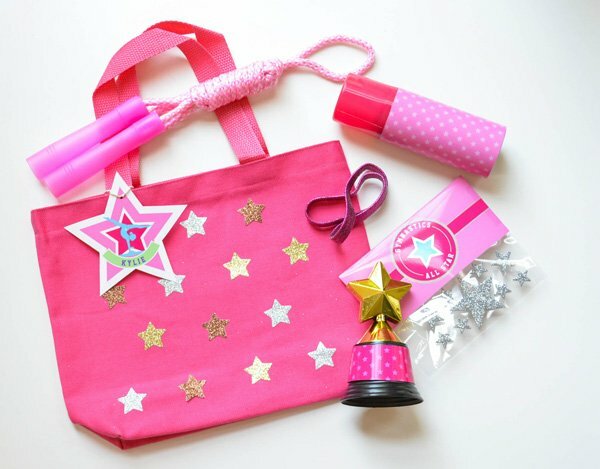 I created colorful canvas bags from Rhode Island Novelty with glitter stars to hold the gymnast’s goodies. 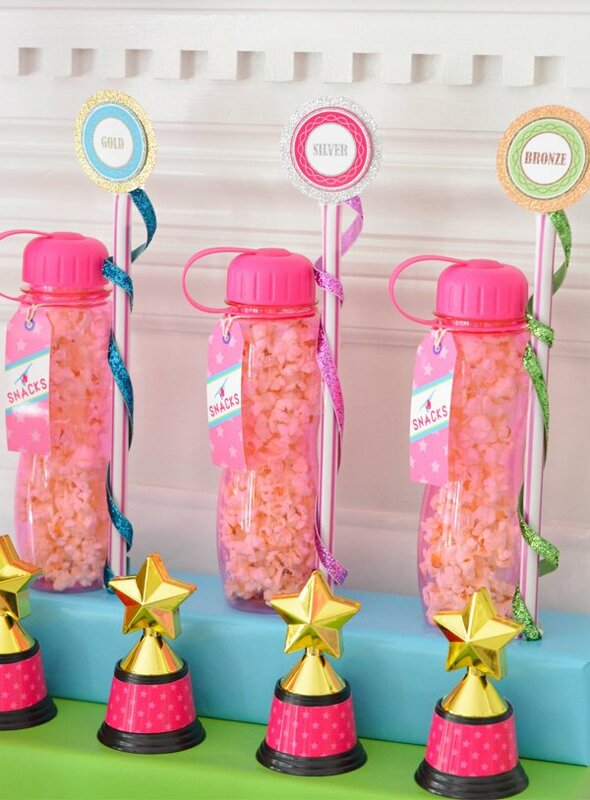 Each bag had silly string wrapped in printable patterned paper, clear cello bags & printable bag toppers with glitter star foam stickers. 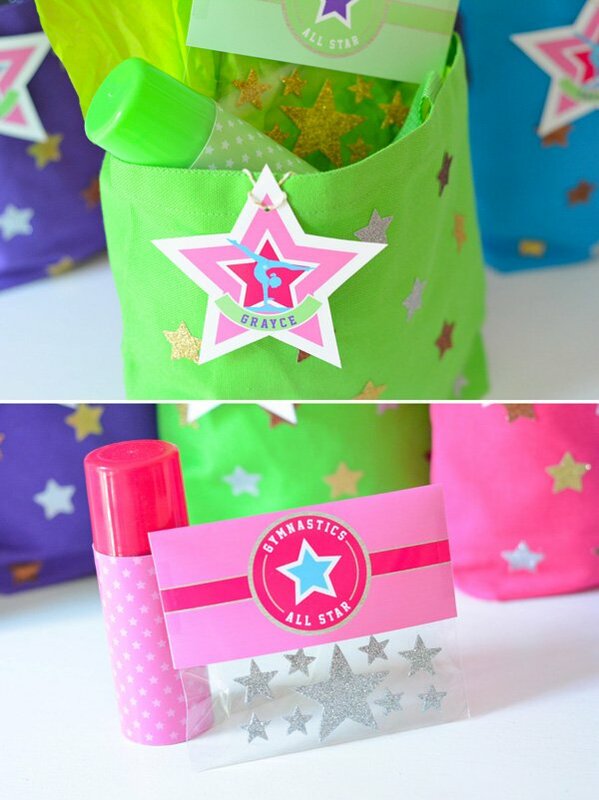 We designed personalized star favor tags for each bag as well. 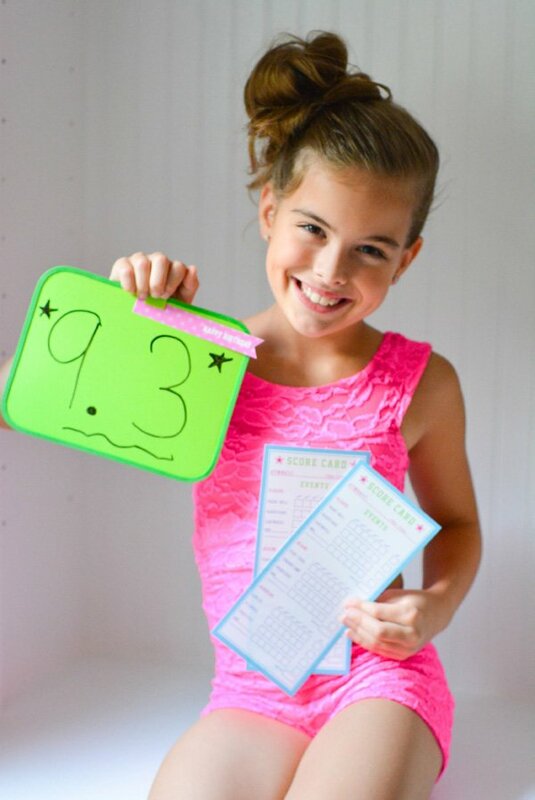 I gave each child a dry erase score board and printable score cards for our “Birthday Meet.” We started off with the gymnastics meet and ended with a triple hula hoop and jump rope contests! The girls LOVED scoring each other and watching each girl do their tricks! The meet included: floor, beam & ribbon events. The 1st, 2nd & 3rd place winners from each category received trophies along with printable medal ribbons (gold, silver & bronze)! Overall, the girls gave the party a 10.0!